The Rumble SF Tonight @ Cafe du Nord! 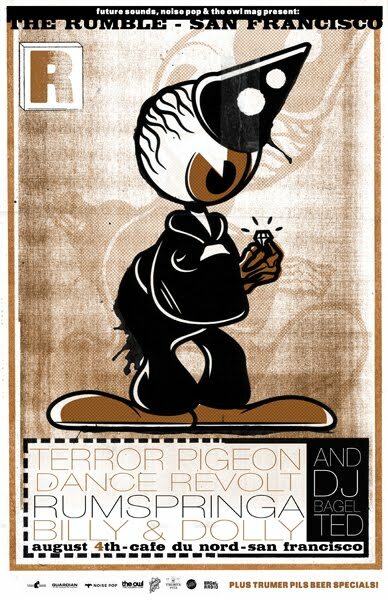 The Rumble SF is tonight at Cafe du Nord featuring Terror Pigeon Dance Revolt, LA’s Rumspringa and San Fran’s Billy & Dolly. At this point I don’t think we’re in need of any more hyperbole about the monthly Rumbles. Why? Because it’s FutureSounds and they never let you down. Plus it’s free with an RSVP, for god’s sake. Just do it. This entry was posted in Shows and tagged queer eyed boy, rumbspringa, the rumble sf. Bookmark the permalink.